Some kids never grow up, particularly when it comes to model trains. 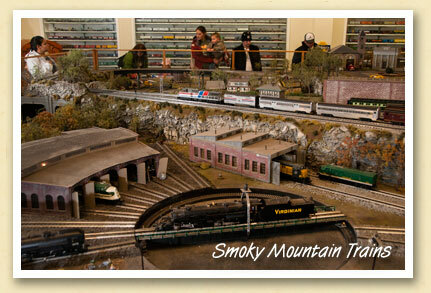 And next door to the Bryson City train depot, there’s a special treat for model train lovers of all ages. Smoky Mountain Trains, a museum dedicated to model railroading, houses a vast collection of 7,000 Lionel engines, rail cars and accessories, some dating back to the early 20th century. The museum’s centerpiece is a large diorama with more than a mile of track on three levels where up to six trains run simultaneously. The layout includes a freight yard with more than 400 cars. There are tunnels, trestles, houses, factories, a five-foot waterfall and 12 animated scenes. The miniature maintenance area includes a turntable and roundhouse (above). There are also smaller train layouts just for kids, with child-friendly buttons that operate the trains and accessories. Admission to Smoky Mountain Trains is $9 for adults, $6 for children; and free for riders on Great Smoky Mountain Railroad excursions.